When you create a secure client or service, you can use a certificate as the credential. For example, a common type of credential is the X.509 certificate, which you create with the X509CertificateInitiatorClientCredential.SetCertificate method. Local computer: The store is local to the device and global to all users on the device. Current user: The store is local to the current user account on the device. Service account: The store is local to a particular service on the device. Select Run from the Start menu, and then enter mmc. From the File menu, select Add/Remove Snap In. The Add or Remove Snap-ins window appears. From the Available snap-ins list, choose Certificates, then select Add. 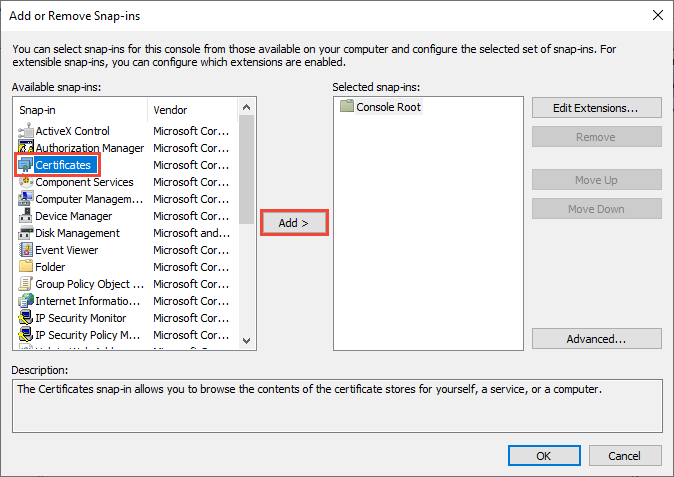 In the Certificates snap-in window, select Computer account, and then select Next. Optionally, you can select My user account for the current user or Service account for a particular service. If you're not an administrator for your device, you can manage certificates only for your user account. In the Select Computer window, leave Local computer selected, and then select Finish. In the Add or Remove Snap-in window, select OK. Optional: From the File menu, select Save or Save As to save the MMC console file for later use. 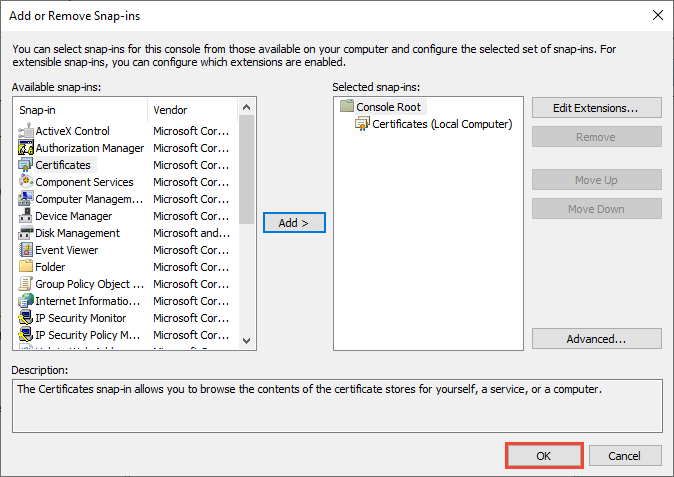 To view your certificates in the MMC snap-in, select Console Root in the left pane, then expand Certificates (Local Computer). A list of directories for each type of certificate appears. From each certificate directory, you can view, export, import, and delete its certificates. You can also view, export, import, and delete certificates by using the Certificate Manager tool. Select Run from the Start menu, and then enter certlm.msc. The Certificate Manager tool for the local device appears. To view your certificates, under Certificates - Local Computer in the left pane, expand the directory for the type of certificate you want to view. Select Run from the Start menu, and then enter certmgr.msc. The Certificate Manager tool for the current user appears. To view your certificates, under Certificates - Current User in the left pane, expand the directory for the type of certificate you want to view.